Directions:From I-75 to SW on 200, T/L onto SW 60th Ave, T/L onto SW 89th St., T/R onto SW 59th Terr. T/L onto 89th Pl. - Home is on the right. 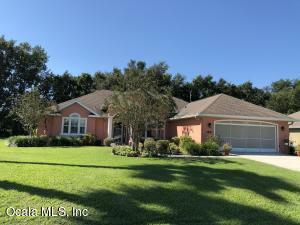 Remarks:Welcome home to this beautiful 3 bedroom 2 bath Al Milton Home in Majestic Oaks! Live the Florida lifestyle with tall swaying palm trees in the front and a large, freshly painted, screened lanai on the back. When you walk through the pretty front door with matching sidelights, you will realize you're walking into an immaculate, well maintained home. All freshly painted inside & out with Sherwin Williams custom colors. Soaring cathedral ceilings, wood laminate flooring in L/R, D/R, Master Bed & hallway. Tile in Kitchen, nook, entrance & bathrooms. Carpet in the two guest rooms. Open floor plan w/living room looking out the triple slider to lanai and very private backyard. Oversized master with plenty of room and slider to lanai. Dual vanity in bath, w/ jacuzzi tub, two linen & a walk-in closet. Kitchen has a large bar with upgraded countertops and LOTS of cabinets with pull-outs. All S/S appliances just 2 years old. Levelor blinds throughout. A/C replaced in 2016. Newer hot water heater. Screened garage. Plant shelves.Private backyard backs up to a pasture w/walking trail for you & doggies. Too many upgrades to mention. This home is move in ready!